If you’re looking for a reliable, friendly and experienced chimney sweeping service then give us a call. 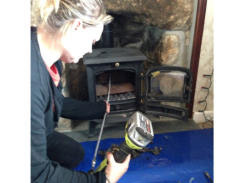 Dirty Dirks offer a chimney cleaning service in Wadebridge and throughout Cornwall. We provide an expert, reliable service to ensure a professional job. We use either the power sweeping method or the more traditional method, depending on work required. We can recommend power sweeping for lined chimneys and can offer a CCTV inspection service if needed. We will carry out a smoke test to ensure that the fire is operating efficiently and the chimney flue is clear. We can also provide advice on the correct type of fuels to use. Plus, we provide other related services too, including stove servicing, bird nest removal and chemical log treatment for tar and creosote build-up. Our customers are important to us and we and take great care to make sure you receive the best possible service. If you would like to discuss any concerns before we carry out any work for you, we are more than happy to discuss them. Our aim is to carry out any work promptly and at a time that is best suitable for you. We are fully insured and certified. Any work we do for you is carried out safely and cleanly to a high standard. The areas we cover include Wadebridge, St Austell, St Mewan, Bodmin, Holmbush, Porthpean, Charlestown, Duporth, Trewhiddle and all surrounding towns and villages. Traditional brush sweeping and power sweeping available. For advice or to obtain a free quotation please call the number below. Dirty Dirks offer a professional chimney sweeping service throughout Cornwall including St Austell, St Mewan, Carlyon Bay, St Blazey, Tywardreath, Charlestown, Porthpean, Trewhiddle, Mevagissey, Penwithick, Carclaze, Trewoon, Redruth, Illogan, St Day, Lanner, Camborne, St Ithians, Caharrick, Falmouth Mylor, Mawnan Smith, Penryn, Truro, Ponsanooth, Devoran, Peranwell, Tresillian, Feock, Probus, Grampound, St Stephen, Roache, St Dennis, Foxhole, Fowey, Wadebridge, Rock, St Issey, Padstow, St Tudy, St Breward, Lostwithiel, Bodmin and all surrounding areas. Copyright © Dirty Dirks ~ All Rights Reserved.